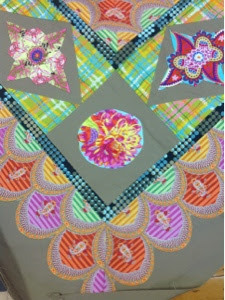 Ginger asked about the scallop fabric on the Liberty Kaleidoscope quilt. 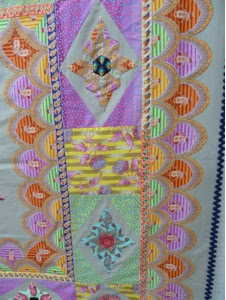 The fabric is from Kaffe Fassett's "Liberty Art Fabrics" range - "Paisley collection". I did a search online and it is still available - in several colourways. You can post here if you locate the fabric - I found it in the UK and USA, and I have seen it in a couple of Sydney shops. 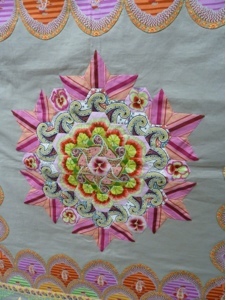 "Sew and Tell" in Berry NSW Australia may be worth a look. They carry a lot of Kaffe Fassett fabrics there. If anyone wants me to check for them, I am happy to.